Four and a half weeks into the school year my boy came down with a cold. Which in turn means that five weeks into the school year I came down with a cold. The cold wasn’t enough to stop me from daily activities, or riding, but with my taste buds dulled by the constant flow of phlegm and cold medicine, and my body a little more stressed than usual during my morning rides in the autumn air, I found myself craving some warm comfort food for lunch. Comfort food to me means one thing–pasta. As I pedaled along all I could think about was a giant bowl of warm pasta! Since I tend to gain weight just thinking about eating food, a giant bowl was out of the question, but a bowl would be had, that much I knew. Love handles be damned!! After I got home and took a long hot shower I turned my attention to lunch, and that bowl of pasta. I am a long time fan of cheese tortellini, and when I saw a bag in the freezer, I knew that was it. I wasn’t in the mood for red sauce, but I had a plan, especially once I saw a bag of frozen peas sitting beside that tortellini. 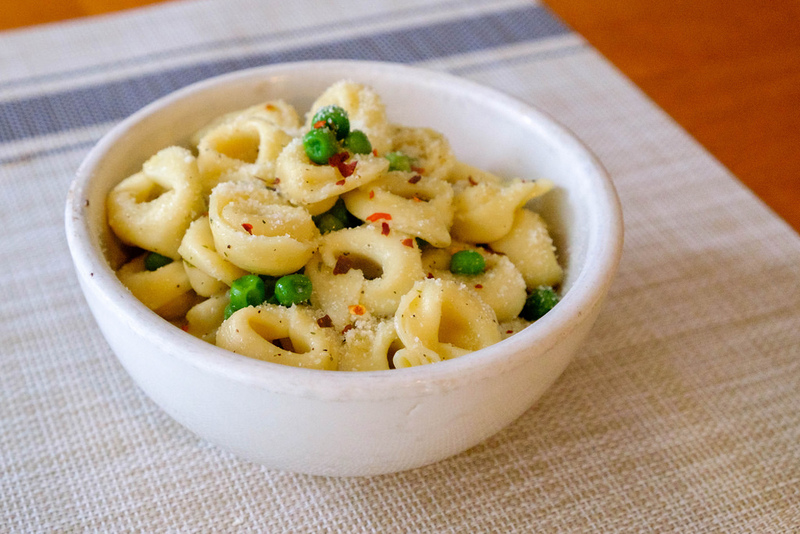 The plan was simple: cook a handful of tortellini and a half cup or so of green peas, then toss them both together with some extra virgin olive oil, parmesan cheese, red pepper flakes, salt, and pepper. It was simple, it was delicious, it was comfort food-tastic! It was just the thing to wake up my taste buds and warm me up. While this was just a small bowl for one person, I have my mind set on making it again for dinner some night, and possibly adding some sautéed chicken breasts or shrimp. One of the best things about this meal is that it took less than fifteen minutes to make. Hell, it may have only taken about ten! Even adding shrimp or chicken to the recipe would only had about an additional five minutes or so. For other posts about the crap I make and eat, visit the Cat 5 Cooking archives.